It’s no surprise that when it comes to making a decision between a free trial or freemium go-to-market strategy, you need to be extremely careful. Unfortunately, you can’t just google the pros and cons of each model or even ask a fellow SaaS founder to find out what will work best for you. Put simply, what works for them won’t necessarily work for you. But, you’re smart—you already know that. In order to make the right choice, you need a decision framework to help you decide between a free trial or freemium model. In this presentation below, I uncover some of the most important things you need to consider when making this difficult decision. But, I couldn’t stop there. No way Jose. That would be too easy. Although there’s arguably a million ways to come to a conclusion on whether a free trial or freemium model is right for your business, I’m going to break down one of the most underrated decisions you NEED to make. And that is…. Will your go-to-market strategy support a free trial or freemium model? What’s the difference between a free trial and a freemium model? By definition, a free trial is a customer acquisition model that provides a partial or complete product to prospects free of charge for a limited time. Whereas freemium is a customer acquisition model that provides access to part of a software product to prospects free of charge, without a time limit. So, it seems that a freemium is the same as a free trial but has no time limit. Although the only big difference is “time” between the free trial and freemium definitions, the go-to-market strategies could not be more different. To start off, what is your go-to-market strategy? Are you dominant, disruptive, or differentiated? This isn’t to say, these are the only three go-to-market approaches you can employ as a business, but chances are they are the main options that will work for your SaaS business if you want to grow fast. But, if you don’t have time, I’m just going to highlight the differentiated, dominant, and disruptive strategies, so you can decide which one works best for your SaaS business. 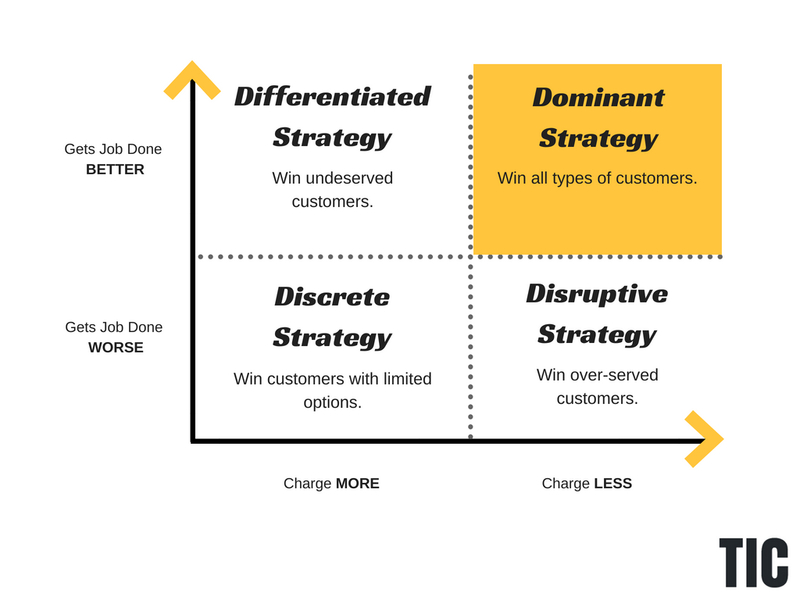 As you can see in the graph below, the dominant, disruptive, and differentiated growth strategies have unique advantages over each other. The dominant growth strategy works great if you do something much better than your market and can charge significantly less. The freemium model can be a vital element in a dominant growth strategy and can help you take a sizable chunk out of a market. But, how big a market? Well, Jason Benkins, the founder of SaaStr, argues in this article that you need 50 million active users for freemium to work. Now, I’d argue you don’t need 50 million active users for freemium to work, but you do need a significant volume of users signing up for the math to work in your favor. So, if you have a niche product, good luck. Employing a freemium model will most likely result in you losing money by giving away your product for free. The verdict: Both freemium and free trial models work much better than the traditional sales model (i.e. demo requests) in the dominant growth strategy because you have to keep your costs low or risk a competitor swooping in to take part of your market share. Remember, your competitive advantage as a business is your low cost and exceptional product. Is my market big enough to support a freemium model? Is my product significantly better than the competition and at a lower cost than anyone else in the market? Is your target audience extremely price sensitive and need a lower price? A Differentiated Growth Strategy is common if you want to pick a fight with a goliath in any industry—and win. Your main weapon against the goliath is specialization. For instance, if you were to take away part of HubSpot’s market share, you might discover an underserved niche (let’s say real estate agents) and create a CRM product that is highly geared towards this audience. Differentiated growth requires you to do a job better than the competition and typically charge more. This approach works well with free trials and demos. However, due to the specialization of these products, I often find that it can be quite difficult to create a freemium experience that gets people to an “aha moment” due to the heavy specialization of features. The verdict: Both free trials and demos work great with a differentiated approach, but due to the market size limitations, a freemium model will most likely not work in this environment. Your competitive advantage as a business is how you solve your customer’s problems. Are you serving underserved customers? How big is your market? Is your ACV high enough to support a low or high touch sales team? Would your prospects be able to experience an “aha moment” in your product if you did a free trial? Most fast growing SaaS companies are labelled as “disruptors”, but don’t let the label fool you. Most SaaS companies never deploy the disruptive go-to-market strategy. At least according to Tony Ulwhick’s growth matrix below. The disruptive growth approach requires you to create what many might consider an “inferior” product all while charging less. Now, most people think this is a bad idea but it’s really not. If you’ve used Canva, a simple custom graphic tool creator, you’ve witnessed this first hand. If you were to compare Photoshop’s features against Canva’s. Canva would flat out lose. But, since there were so many over served customers in this particular market, Canva was able to build a much simpler product that solved very specific pain point—creating social media graphics—and dominate the market. The verdict: The freemium model thrives in the disruptive environment as it is very important to keep costs low to increase the magnetic draw for prospects using existing solutions to make the switch. In addition, since the product is a scaled down version of an existing solution, it is essential that the product be easy for people to use as well as solve a specific job. A free trial can still be employed while using a disruptive growth strategy but can often limit the “magnetic draw” that the freemium model has. Is your competition over serving their customers? Do you have the resources to support a freemium model? By now, I want you to take action and decide whether your SaaS product follows a dominant, differentiated, or disruptive growth strategy. Once you know your go-to-market strategy, you’ll see that it becomes much easier to decide between a free trial or freemium model. If your product does something much better than your market and you charge significantly less, a dominant growth strategy might be a good fit for you. Both freemium and free trial models work exceptionally well in supporting the dominant growth strategy as they are both customer acquisition models and cost-effective. However, if you know there’s a well-defined need that’s being addressed poorly, a differentiated approach might work really well for you. Differentiated growth requires you to do a job better than the competition and charge significantly more. This is not a one-size fits all model. Both free trials and demos work great with a differentiated approach, but due to the market size limitations, a freemium model will most likely not work in this environment. Whereas, the disruptive growth approach requires you to create what many might consider an “inferior” product all while charging less. Now, most people think this is a bad idea but it’s really not. Given the nature of having a simpler solution than your competitors, the freemium model thrives in the disruptive environment as it is very important to keep costs low to increase the magnetic draw for prospects using existing solutions to make the switch. Now, I’m curious. What does your go-to-market model look like? Wes Bush helps B2B SaaS leaders launch and optimize product-led engines at Traffic Is Currency. You can find his free course about learning who your best customers really are—and how to find more of them—at doubleyourtrials.com.